Dumpster rentals are available for commercial and residential usage. If you’re having major construction done on your home or office, having a large receptacle for rubbish, plumbing and drywall is a must. Junk Removal of STL has several sizes available whenever you need them. We drop them off and pick them up upon request. You just purchased an old home in the Delmar Loop. Although, you love its unique character, it needs a lot of work. Instead of hiring an architect and construction company, you and your dad have decided to do the work yourselves over several weekends. Our dumpster rental will come in handy. 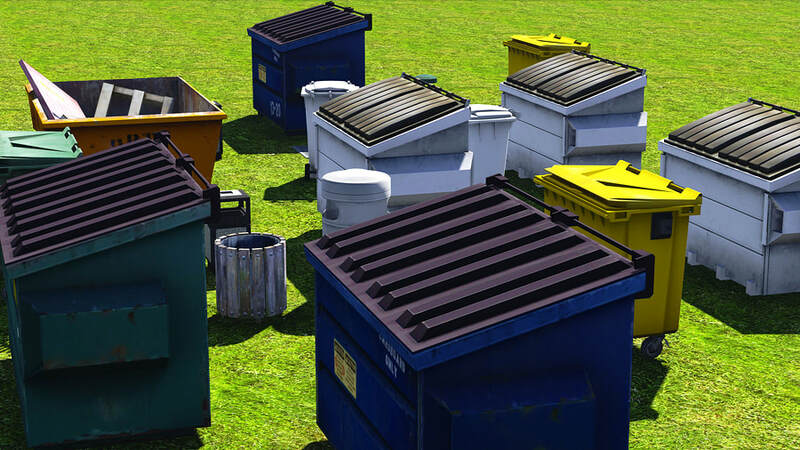 Choose from 4 different dumpster sizes. 10, 12, 15 and 20 yard dumpsters are available for your project. They can each hold a capacity of 3 tons. They vary in price. The 10-yard dumpster is priced at $260. The 12 yard is $270. For a 15-yard dumpster, we require a fee of $300. Our largest dumpster of 20 yards is priced at $330. The prices include a 7-day rental. $10 per day is charged beyond the original 7-day agreement. We can relocate the dumpster to another site upon request. If you’d like to have it moved from the front of your home to the rear, this is not a problem. When using our dumpsters for commercial or residential applications, pretty much any thing goes. Cardboard and paper products are totally fine. Bricks, pipes, steel, iron and sheet metal can be accommodated. Asphalt roof shingles can be dumped along with carpet, tile, linoleum and hardwood flooring. We accept vinyl, aluminum and steel siding. Lumber, mattresses and box springs are permitted. Plaster, sheetrock and furniture are allowed. Plastic, foam and glass are permissible. Yard waste can be dumped if it is not mixed with other debris. Paper products, bricks, concrete, metal and asphalt roofing can be recycled if not dumped with other trash. There are several items that cannot be deposited in the dumpster. Appliances are a big no-no. We provide a separate severance to help you get rid of stoves, furnaces, hot water heaters, washers and dryers. HVAC systems, stoves, freezers, dishwashers and refrigerators can be picked up separately. Any electronics such as computers, stereo systems, televisions, VCRs, DVD players, gaming systems and printers can be disposed of separately. Please refrain from dumping tires and paint into the dumpster. Hazardous waste materials and flammable items are not accepted. Junk Removal of STL is a full service junk removal company. We don’t expect you to collect the dumpster. It is a feature of our best in class service to bring the dumpster to you. Each dumpster can accommodate 3 tons of waste and debris. If you require a second dumpster during the demolition process, it would be our pleasure to remove the original dumpster and replace it with an empty one. For extended projects spanning from 1 month onward, we recommend a long term rental agreement. This will save you money in the long run. For more information about dumpster rentals, contact us today.